Oakland seafood eatery alaMar ditches cash in favor of credit cards and payment apps. Success in the restaurant business requires flexible thinking, so Nelson German was willing to reconsider everything when he revamped his restaurant, alaMar, a couple months ago. He decided to throw out the entire cash drawer. Now the seafood eatery is entirely cash-free. Diners can pay for their lunchtime poke and Dominican rice bowls with plastic or phone apps like Google Wallet, Venmo and Apple Pay. German's wife and co-owner, May German, ran the numbers and decided it was a good way to serve customers faster and save on labor costs. Don't try to pay with cold, hard cash for your Dominican rice bowl or fresh poke at Uptown Oakland seafood eater alaMar. The restaurant will only take plastic. So bring your credit card or your phone loaded with payment apps like Venmo, Apple Pay and Google Wallet. "It reduces our labor costs by at least 5 percent, which is critical in this day and age, because you're cutting the hours of somebody counting the cash, counting the till and refilling the till," Nelson German said. With a paper trail, the till is never short. Only taking credit cards also reduces errors, the risk of theft, and the time that customers spend waiting for food, he said. "Going cashless minimizes the amount of time that you're on the line by 7 seconds. It takes 7 seconds more when you're paying with cash. That's 7 seconds that you get back. And time is money," he said. The conventional wisdom is that small business owners prefer cash to avoid fees charged by credit card companies. But May German, who co-owns the restaurant with her chef husband, ran the numbers and decided otherwise. Once alaMar's owners committed their customers to paying with plastic, they were able to renegotiate with the banks for lower fees. Now instead of a cash till at each register, there are screens: one for regular credit card transactions, and two for online delivery services. Nelson German said he and his staff spend less time counting cash at the end of their shifts and going to the bank to deposit cash. With the cost of labor and ingredients rising in a business known for its low-profit margins, Nelson German said he wants to pay his employees for essential work and send them employees home when he can. He gave customers a couple weeks to absorb the change, and then did away with cash. "We've got more people coming in because they know they're getting delicious food fast. More turnover is good for us," he said. With higher volumes, tips are up, he said, in part because the new screen-based credit card payment systems calculate and suggest the right amount to tips. His staff is taking the change in stride and waiting to see how the change plays out. 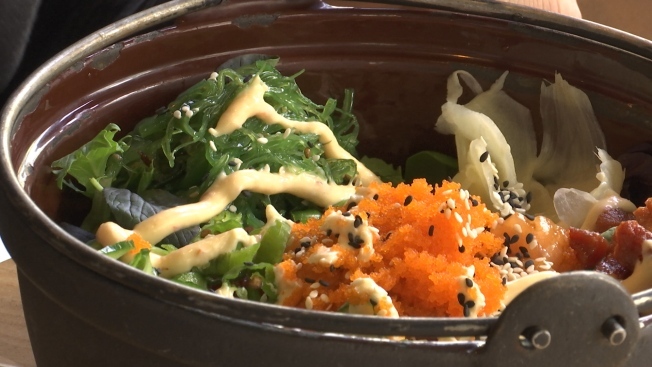 Vanessa Reyes had her hands full as it was, explaining the options to customers online at the poke bar, scooping fish and squeezing sauces into bowls, and swiping credit cards at the register. "It makes my job easier. I don't have to count out the customer's change. I can just swipe the card, turn the machine and they're off," she said. No one balked at the cash-only rule during the lunchtime rush on a recent weekday. Many customers ordered to-go or sat down for lunch with colleagues. "It works fine for me. I typically don't carry much cash anymore," said Jean Flores, who works nearby. With thousands of office workers all breaking for lunch at the same time in a tightly packed downtown neighborhood, the cash-free concept works well for alaMar's neighborhood, German said. Meanwhile, with upscale condos going up all around, his restaurant is becoming the local seafood spot for many of his new neighbors.